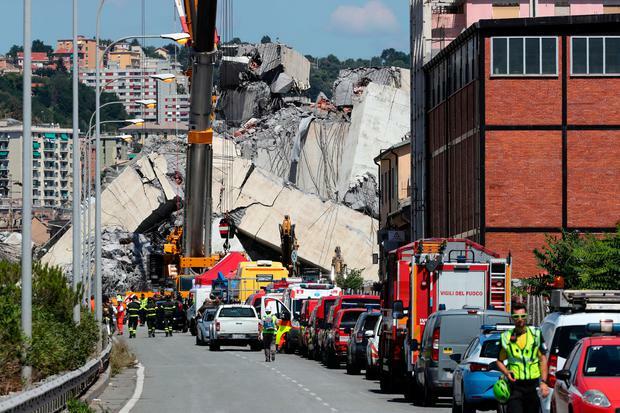 AS many as 300 bridges, viaducts and tunnels in Italy are at risk of structural failure, experts warned – as the death toll from Monday’s collapse of the Morandi bridge in Genoa rose to 39, including three children. There were fears last night that the number of fatalities could rise still further. Matteo Salvini, Italy’s interior minister, said it was hard to tell how many people were still unaccounted for simply because they were on holiday or “under the rubble”. Around 70pc of Italy’s 15,000 motorway bridges and tunnels are more than 40 years old, many of them built during the post-war boom but now carrying far more traffic than they were designed for. Lack of investment, poor maintenance and, in some cases, the involvement of mafia-run building companies that use poor quality concrete to increase profits, could all contribute to disasters like the one in Genoa. Among the structures at risk was the Magliana Bridge in Rome, between the city centre and the capital’s busiest airport, Fiumicino, he said. Italy’s CNR civil engineering society called for a “Marshall Plan” to repair or replace tens of thousands of Italian bridges and viaducts built in the post-war period. As investigators began to study what may have caused a 260ft-long portion of the raised motorway in Genoa to collapse, sending around 35 cars and several trucks plummeting to the ground, Italy’s populist government blamed the private company that managed it. Luigi Di Maio, deputy prime minister and the leader of the Five Star Movement, accused Autostrade per l’Italia of chasing profits at the expense of public safety. Autostrade, which operates nearly 3,200km of Italian motorways, is controlled by the Benetton group through its holding company, Atlantia. Mr Di Maio accused previous Italian governments of turning a blind eye to the upkeep of the country’s motorways because of political contributions. The government said it wanted to revoke the contract awarded to Autostrade and hit the company with a €150m fine. Autostrade insisted that the bridge had been “constantly monitored” and refuted accusations that it had not invested enough in maintenance. As the coalition, which consists of Five Star and the hard-right League party, called for heads to roll, it emerged that in 2013, Beppe Grillo, the founder of Five Star, had opposed plans to build a new motorway that would have alleviated pressure on the Morandi bridge. Mr Grillo dismissed warnings that the bridge could collapse as “a fairy tale” on his widely read blog. When the plans for the new motorway were blocked, one leading industrialist predicted that the Genoa bridge would fail. “When, in 10 years’ time, the Morandi bridge collapses, and everyone is stuck in traffic jams for hours, we’ll need to remember the names of those who said no,” said Giovanni Calvini, who was then regional president of Confindustria, an employers’ association.